I’ve decided that I’m not going to overdo it on pumpkin this year- well, maybe a little. While pumpkin seems to be the highlight of the fall season; apple, maple, and cranberries deserve some props, too. But, those are for other posts. 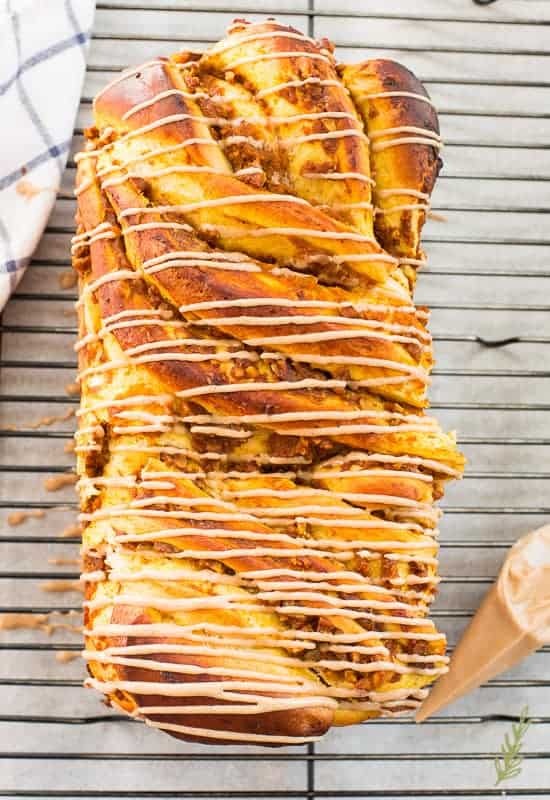 This Pumpkin-Pecan Babka with Cinnamon-Maple Glaze is something that I love to prepare once pumpkin is available. Babka is a bread of Eastern European origin. It’s very similar to our cinnamon swirl bread here in the States. Don’t be intimidated by its appearance. If you know how to roll dough into a log and cut it- you’re set. 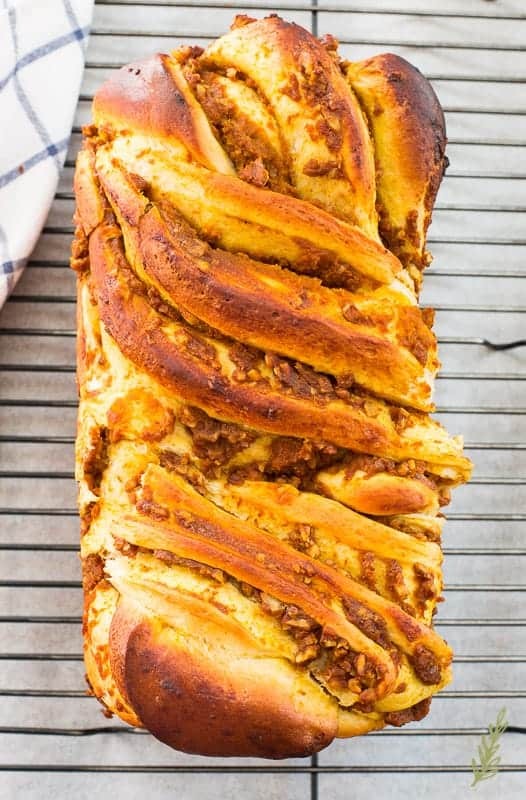 What’s in this Pumpkin-Pecan Babka? Well, pumpkin, for starters. I’m using the last of my store-bought pumpkin here. After this recipe, I’ll be using my homemade Pumpkin Puree. For now, the canned stuff gets the job done. Pecans (unsalted and chopped) along with yeast, flour, water, salt, and- since this is an enriched bread- eggs, butter, and sugar. Everything needs to be at room temperature for this bread, so pulling the ingredients out ASAP is key. Full disclosure, this bread dough makes two one-pound loaves. Make two babkas! One for now and freeze the other for later. Most breads begin with some sort of starter. Sourdoughs are the most common breads with starters. This Pumpkin-Pecan Babka has a starter, or sponge, that is not fermented (like a sourdough is). It also only takes an hour, or less to develop. 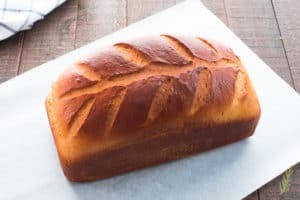 I have more detailed posts about breads, and their development, here and here. 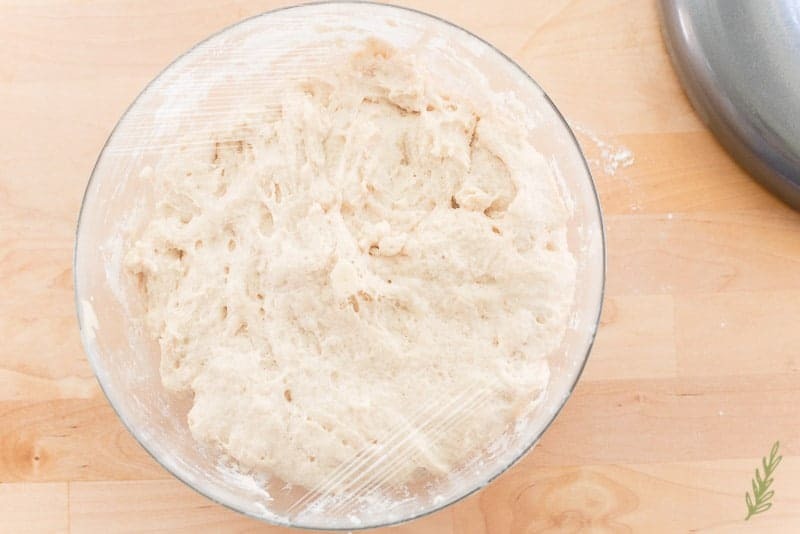 While it may seem unnecessary to make a starter, it’s actually an important step in bread doughs- even this one. A significant amount of butter makes this babka temperamental. The starter gives the yeast that’s used to leaven the dough a head start. It also contributes a great deal of flavor to the overall Pumpkin-Pecan Babka. And it’s so easy to make! In a small saucepan, scald the milk. Once you see steam rising from the surface of the milk, remove it from the stove and allow it to come to one-hundred ten degrees (F). This feels a little warmer than tepid on your finger. Add the honey, then the yeast, to the milk. I always use active-dry yeast because it’s the one that’s most accessible to me. Whenever you use yeast, wait about five minutes after adding it to your recipe’s warm liquid to see if it reacts. In that amount of time you should see the mixture begin to bubble and move about. This lets you know the yeast is alive. It also means it’s safe to proceed with the rest of the recipe. Not taking this short amount of time to check your yeast could lead to a waste of ingredients if your yeast has died. 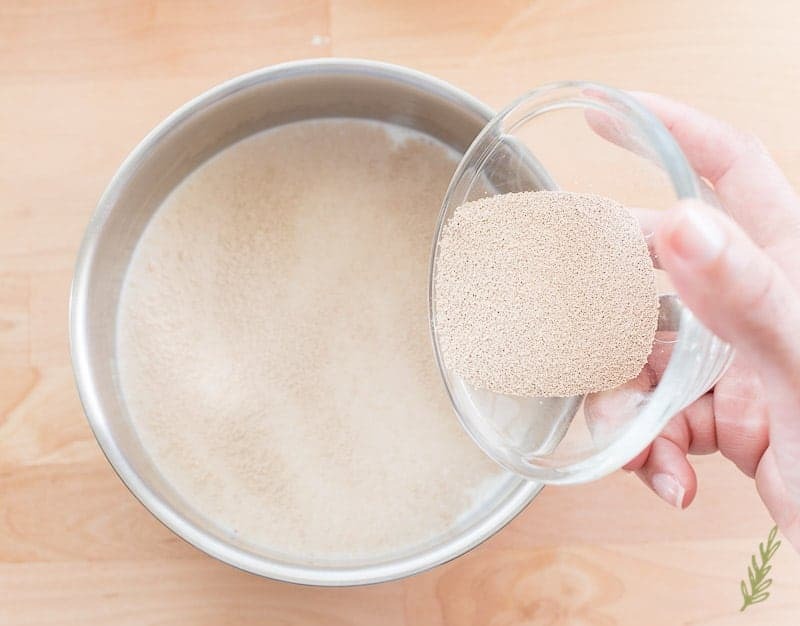 Measure the bread flour into a medium-size mixing bowl, then add the yeast mixture and whisk, or fold the two together, to create a very thick batter. Bread flour is used for this starter because it adds body and strength to the finished babka. You can substitute all-purpose flour, but it won’t be as chewy and will lack the structure you want. Wrap the bowl in plastic wrap, or cover it with a clean kitchen towel, and allow the sponge to ferment for an hour. Choose a spot in the kitchen that’s warm and free of drafts. I mentioned before that this babka is an enriched bread dough. 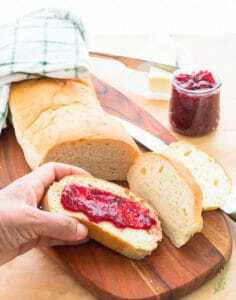 Unlike a lean bread dough, which doesn’t contain many- if any- other ingredients besides yeast, water and flour; an enriched dough contains fats, eggs, and sugar (amounts vary from bread to bread). In other words, if I were a bread, I’d want to be an enriched dough. 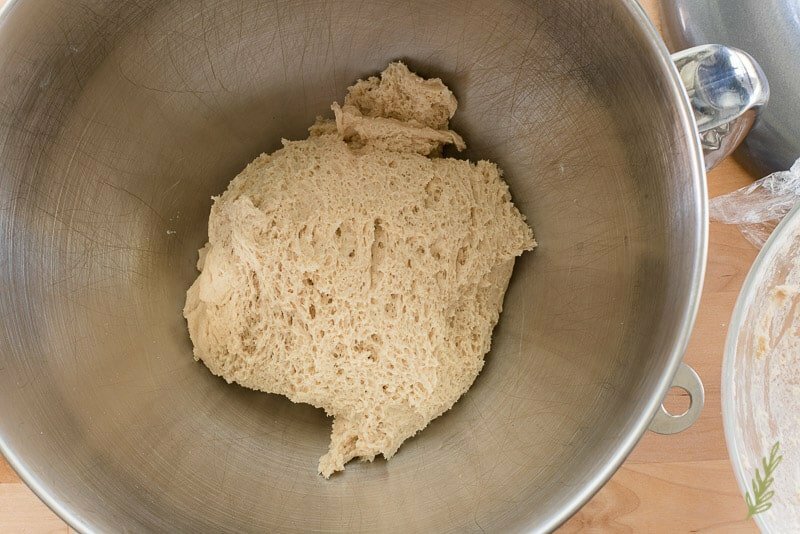 To make the “Marta-Dough” add the sponge to the bowl of a stand mixer. You can tell, just by looking at it, why we call it a “sponge”. It’s aerated and spongy in appearance and texture. It also has a hoppy, malty smell and taste that’s going to be amazing in our babka. Add the eggs, sugar, and salt to the bowl and begin mixing on low speed using the paddle attachment. 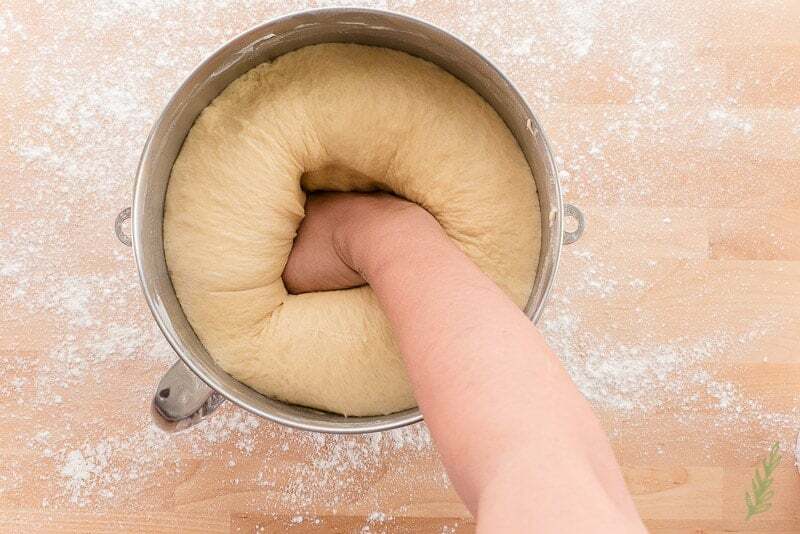 You can most certainly mix the dough by hand, it’ll just take a little longer. 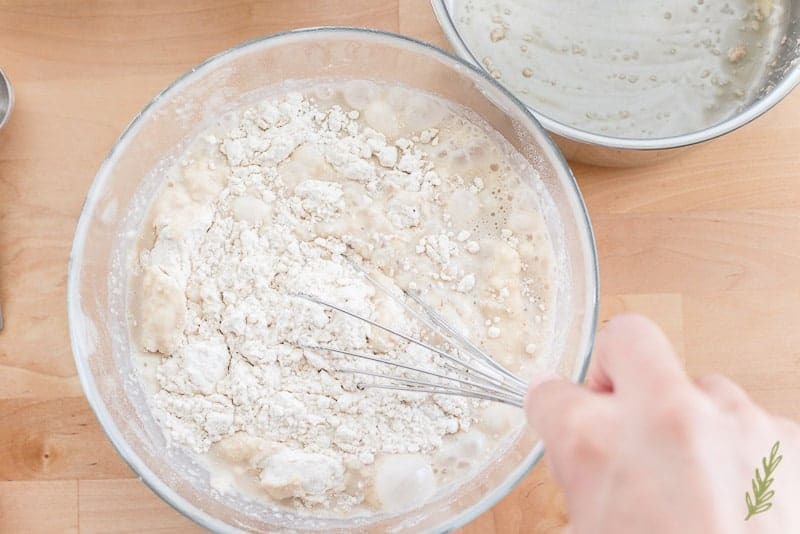 Use your measuring cup to add a couple of cups of flour to the batter. 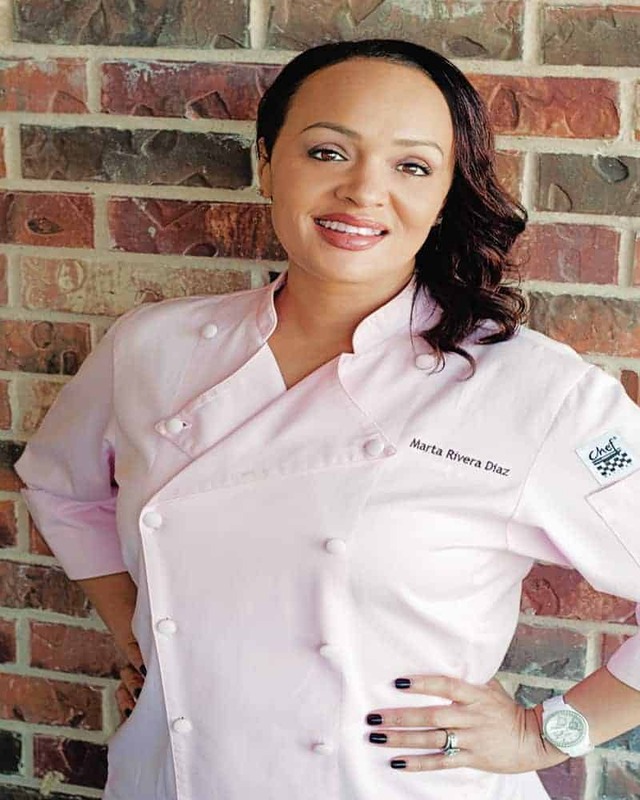 Your goal is to create a thick batter that is similar in appearance to a drop biscuit dough. Thick, but the paddle attachment shouldn’t struggle against it. Once it reaches that point, switch the paddle attachment for your dough hook and add the remaining flour, a little at time. Finally, for the dough development at least, begin incorporating the room temperature butter. Just pop in one or two pats at a time, mixing them into the dough until they’re no longer visible. If this reminds you of my brioche bread method, that’s because it is. For me the “Babka” of this recipe is the method of rolling and fashioning the loaf in a babka-esque loaf. Continue kneading the dough for ten minutes on second speed. When ready, the dough should be soft, supple, and not sticky. Remove the dough from the bowl and lightly grease the bowl with the butter residue from the wrappers, or with a neutral-tasting oil. Return the dough to the bowl and flip it over to oil what will be the surface of the dough. Wrap the bowl in plastic wrap, or cover with a clean kitchen towel. Let the dough to rise for one hour, or until doubled in bulk. Again, you’ll need a warm, draft-free area for this. Use the oven (turned off) with the oven light turned on for that warmth. While your dough is rising, you should finish off the other components. 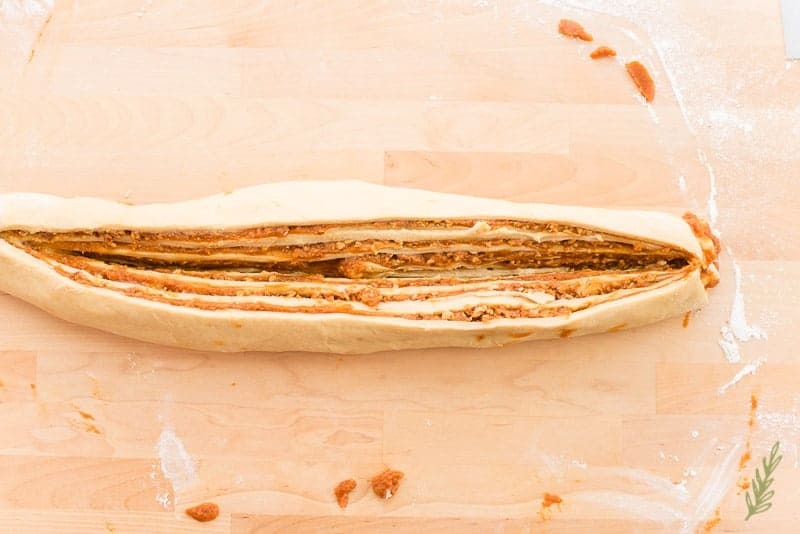 Creating the filling for our Pumpkin-Pecan Babka is as easy as it gets. Grab a rubber spatula and another mixing bowl. 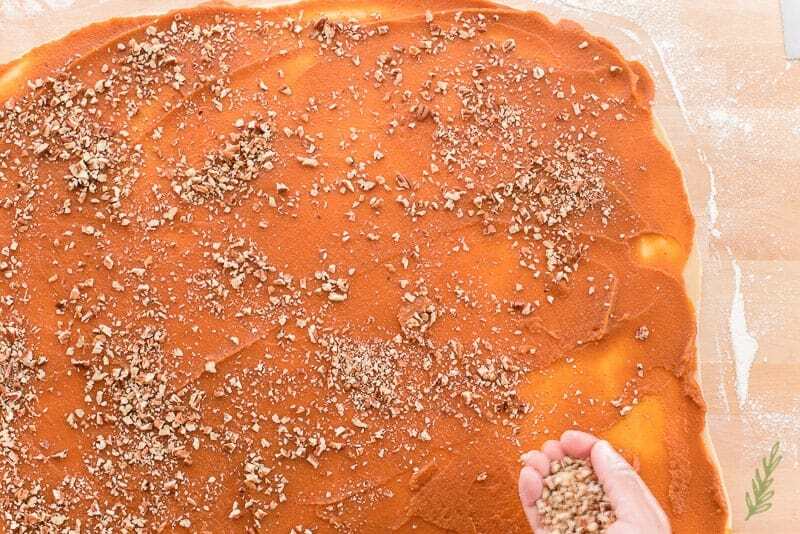 In it, combine the pumpkin puree, pumpkin-pie spice (or you can substitute ground cinnamon), and brown sugar to the bowl. Fold the three together until the mixture is well-combined. Set this aside. 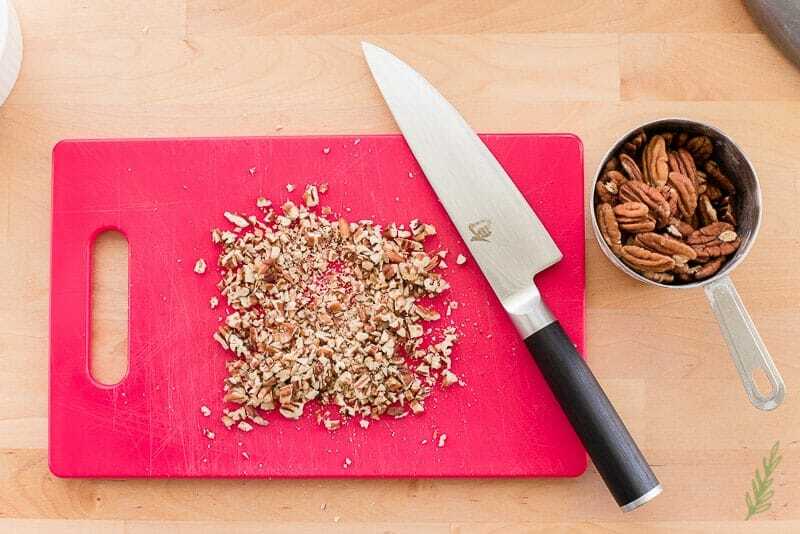 Use your cutting board and a chef’s knife to chop the unsalted pecans. Aim for small pieces of pecan (about a quarter of an inch big). Large pieces of pecans will cause the bread to rip when you slice it. You can also use pecan pieces (already chopped), so long as you can see the pieces of pecan in the bag. If they’re small enough, use those and skip this step. This sight will never cease to excite me. A perfectly proofed, supple dough is a sight of beauty. Too bad we have to destroy it. By punching it, we dispel all the gas that has developed during proofing. But, we gotta do it! So…do it. Then turn the dough out onto a lightly floured surface. 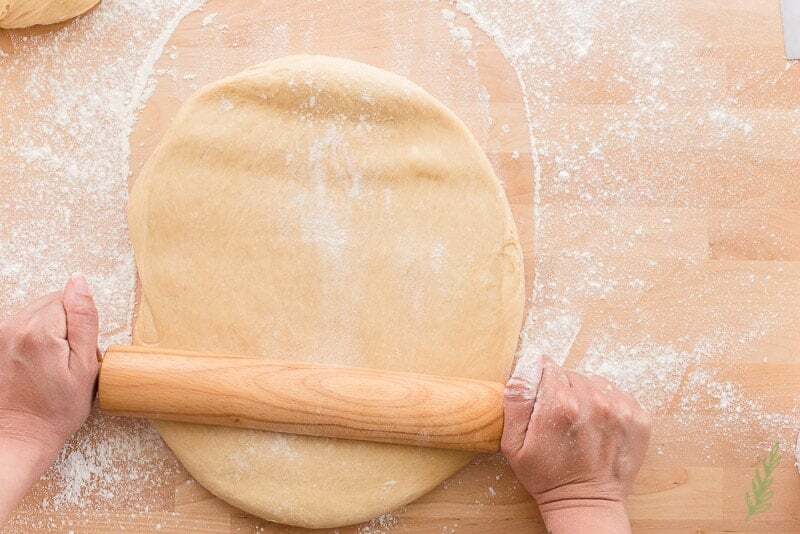 Use a floured rolling pin to roll the dough out into a nine-by-thirteen inch rectangle. It doesn’t need to be precise, but it can’t be toooooooo large. The larger the rectangle, the larger the babka, which means the longer it will have to bake. Spread the filling over the surface of your dough, leaving a one inch margin on one of the long sides (for sealing the roll after you’ve rolled it up). Sprinkle the pecan pieces over the pumpkin mixture. Press the pieces into the filling slightly to make sure they don’t go running away when you start rolling. Beginning with the side sans the one inch margin, roll the dough into a “cinnamon-roll” log. Here’s a refresher. Make sure you’re rolling it tightly. Loose rolling will leave the babka floppy and unstable when you cut it. 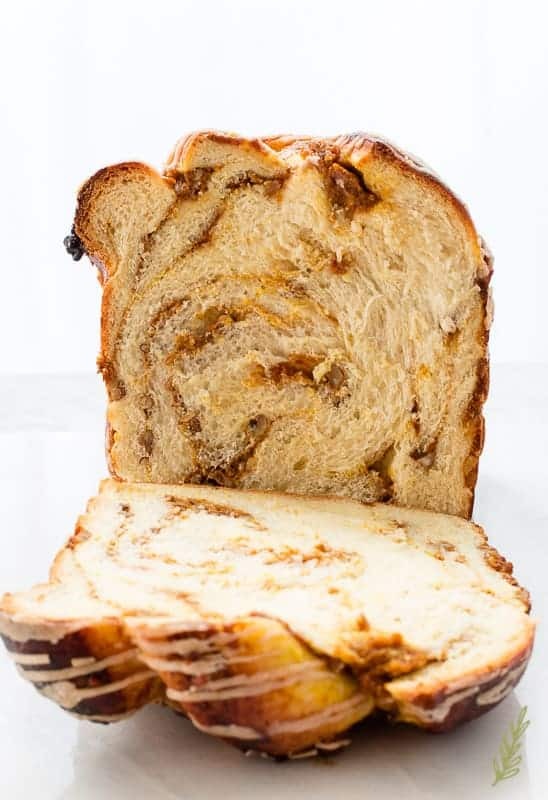 The intricate twist of the baked loaf is what a babka is known for. As intricate as it may look, it’s not difficult to achieve. A bit messy? Yes. But not difficult. Using a lame, or a sharp knife, cut the roll you’ve just formed down through the center. BUT!!! Be sure to leave one inch of one end uncut. So, if you’re looking at your roll, begin making the cut one inch from one of the ends of the roll. This will leave you with a base that will help when you twist the babka. If you happen to forget, no worries, it’ll just be a little more difficult to twist it without it getting too messy. 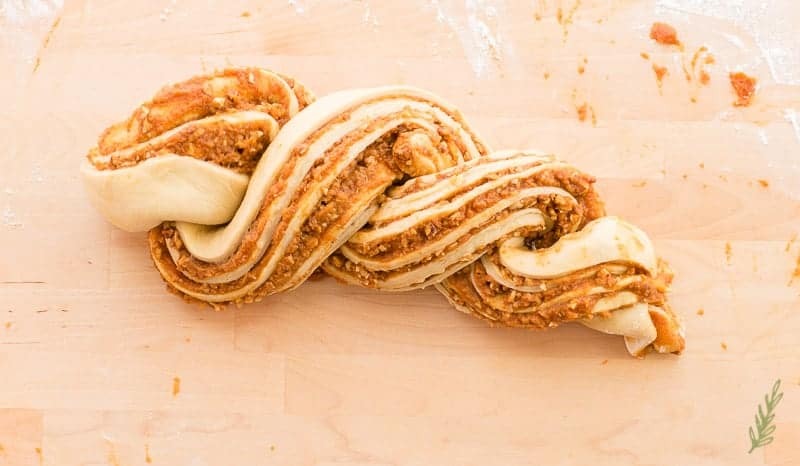 Twist the Pumpkin-Pecan Babka by overlapping the two sections of rope you’ve created with the cut. Try to keep the filling pointing up as you twist. This will not only prevent too much of a mess, but will give it that beautiful look we’re going for. Carefully place the twisted dough into a one-pound bread pan, then cover the pan with a clean kitchen towel. Allow the bread to rise, once more, in a draft-free area for thirty to forty-five minutes. You want the surface of the dough to have risen about an inch to a half-inch from the top of the pan. Once the dough has finished rising, brush it with egg wash, and bake for one hour. If you find that the babka is browning too much on one side, rotate the pan. If, after awhile, it’s browning too much overall, lightly cover it with a piece of foil. It needs to bake for that hour to ensure it’s fully baked throughout. While the Pumpkin-Pecan Babka is perfect on its own, it’s even perfecter (I know that’s not a word) with this Cinnamon-Maple Glaze. While the babka is baking, combine the powdered sugar, a teaspoon of ground cinnamon, and a pinch of salt in separate mixing bowl. 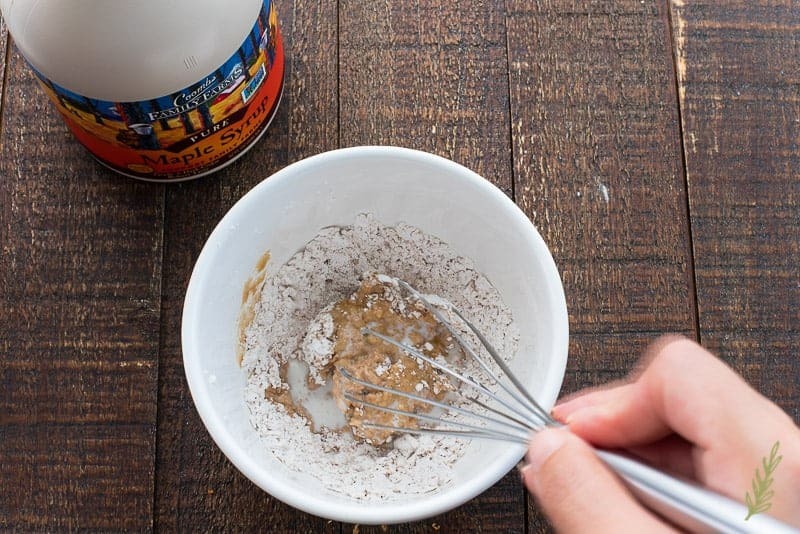 Use a small whisk to stir in the maple syrup (the real stuff, none of that fake, colored corn syrup) and a splash of milk. You want the glaze to leave a ribbon behind when you lift the whisk out and drizzle it back into the bowl. I hope that makes sense to you. You want it to be slightly thick, is what I’m saying. When the Pumpkin-Pecan Babka has finished baking, remove it from the oven and allow it to cool, in the pan, for five minutes. This helps the bread build up more structure before it’s removed from the pan. Remove it from the pan and transfer it to a cooling rack. Allow it to cool for at least twenty minutes. Spoon the Cinnamon-Maple Glaze into a piping bag, cut a quarter inch off of the piping bag, and pipe the glaze on to the surface of the babka. You can also drizzle it from a spoon. You can glaze the babka even if you plan to freeze the entire loaf, or any part of the loaf. I’ve found there’s no issue when I thaw it and toast it. Use a bread knife to slice the bread and enjoy! 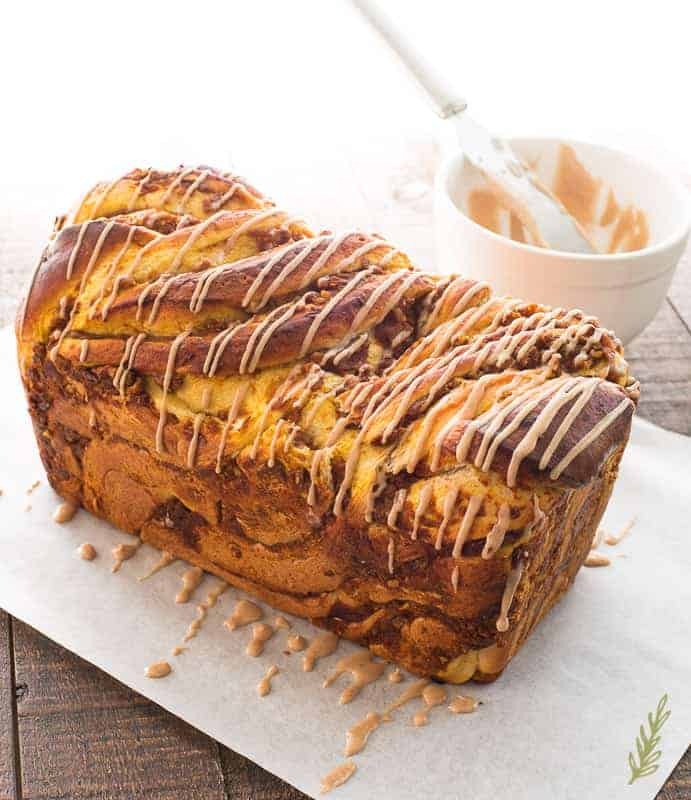 This Pumpkin-Pecan Babka with Cinnamon-Maple Glaze is perfect for holiday gift-giving, baking for large family gatherings, or as a change of pace for your morning meals. It freezes (wrapped in plastic wrap and stored in freezer storage bags) for up to two months. Just thaw and toast (if desired) when you’re ready to eat. Pin and share this recipe with your world! While this recipe makes TWO one-pound babkas. You can bake both and freeze one for later. See notes on freezing. In a small saucepan, scald the milk. Once you see steam rising from the surface of the milk, remove it from the stove and allow it to cool to 110°F. 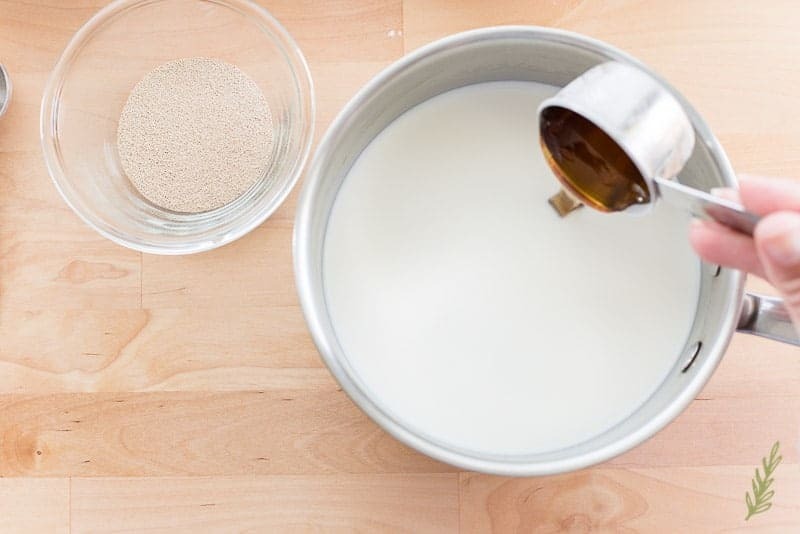 Add the honey and yeast to the milk. Wait 5 minutes after adding it to the milk to make sure it is live. If it begins to foam, continue. If it doesn't, throw it out and start again with new yeast. Add the bread flour to a medium-size mixing bowl, then add the yeast mixture and whisk them together to create a very thick batter. Wrap the bowl in plastic wrap, or cover it with a clean kitchen towel, and allow the sponge to ferment for 1 hour in a draft-free, warm area of your kitchen. 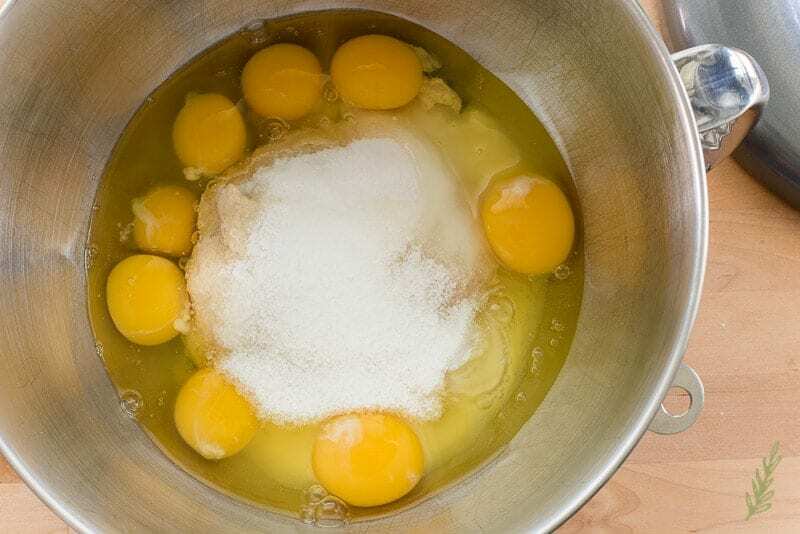 Add the sponge to the bowl of a stand mixer, followed by the eggs, sugar, and salt to the bowl and begin mixing on low speed using the paddle attachment, or by hand. 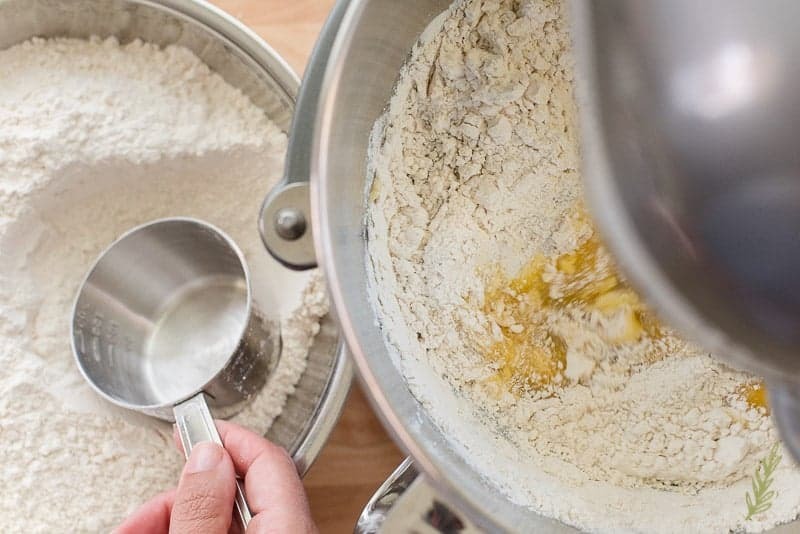 Add 2 of cups of the all-purpose flour to the batter to create a thick batter that is similar in appearance to a drop biscuit dough. 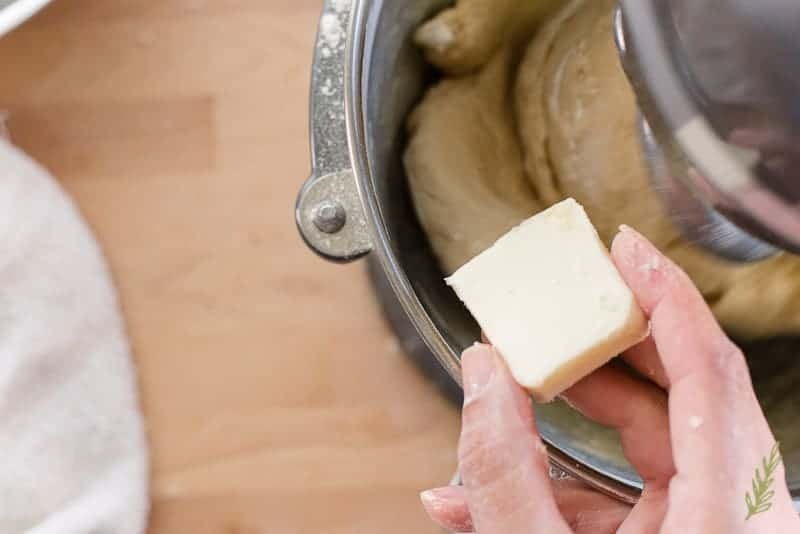 Once it becomes thick and smooth, switch the paddle attachment to the dough hook and add the remaining flour, a little at time, until all is incorporated. Begin incorporating the room temperature butter, one tablespoon (1/2" pat at a time). Mix the butter into the dough until they're mix into the dough. Continue kneading the dough for 10 minutes on second speed, until the dough is soft, supple, and no longer sticky. Remove the dough from the bowl and lightly grease the bowl with a neutral-tasting oil. Return the dough to the bowl and flip it over to oil the surface of the dough. 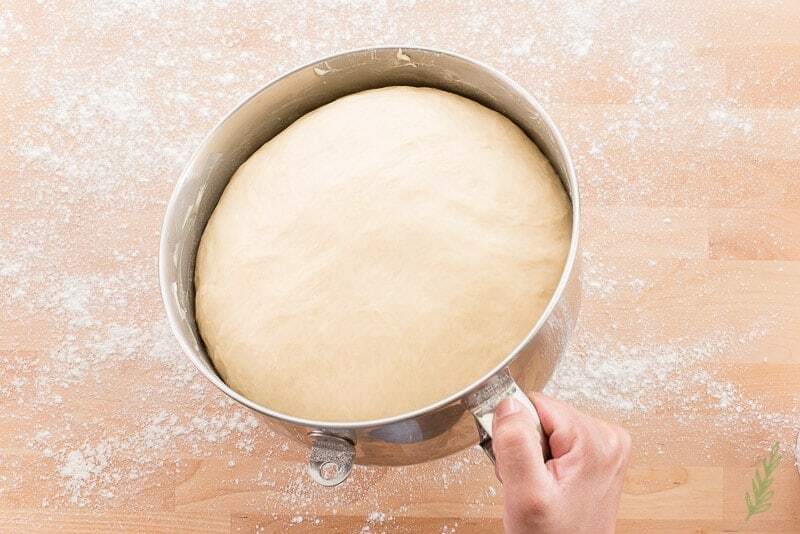 Cover the bowl and let the dough to rise for one hour, or until doubled in bulk in a warm, draft-free area. 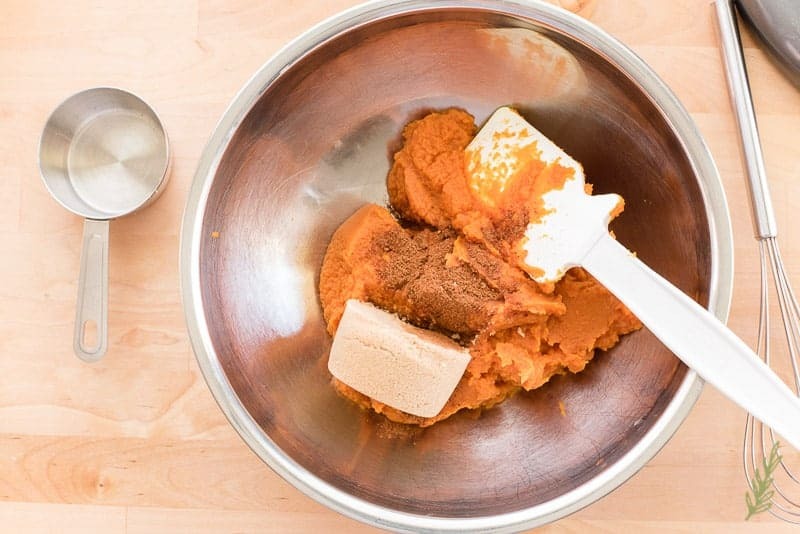 In a mixing bowl, combine the pumpkin puree, pumpkin pie spice, brown sugar, and pinch of salt to the bowl. Fold the three together until the mixture is well-combined. Set this aside. Chop the unsalted pecans into 1/4" pieces. Once the dough has completed its first rising, punch down the dough to dispel the gas that has developed during proofing. Turn the dough out onto a lightly floured surface, then roll the dough out into a 9x13" rectangle. 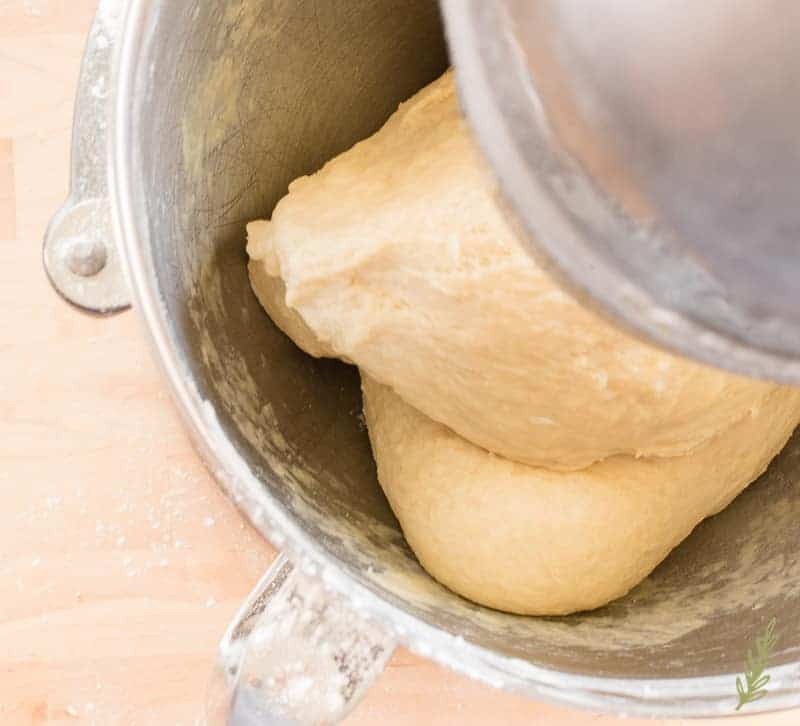 Use an offset spatula to spread the filling over the surface of your dough, leaving a 1" margin on one of the long sides (for sealing the roll after you've rolled it up). 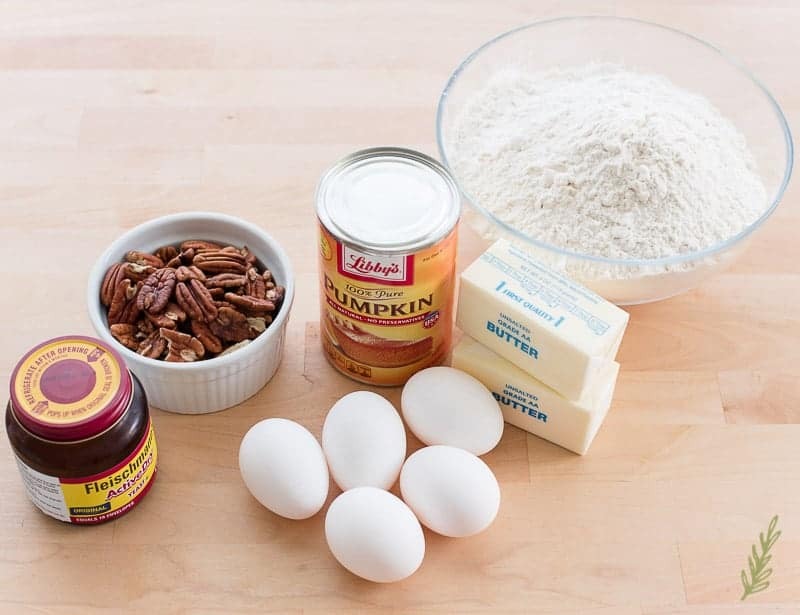 Sprinkle the pecan pieces over the pumpkin spread. Press the pieces into the filling slightly. Beginning with the side without the 1" margin, roll the dough into a tight "cinnamon-roll" log. Using a lame, or a sharp knife, cut the roll down through the center, leaving 1" of 1 end uncut. Twist the Pumpkin-Pecan Babka by overlapping the 2 sections of rope. Try to keep the filling pointing up as you twist. Place the twisted dough into a 1-pound bread pan. Cover the pan, then allow the bread to rise to just under an inch from the top of the bread pan- this should take anywhere from 30-45 minutes. Preheat your oven to 350°F. Place your rack in the lower half of your oven. 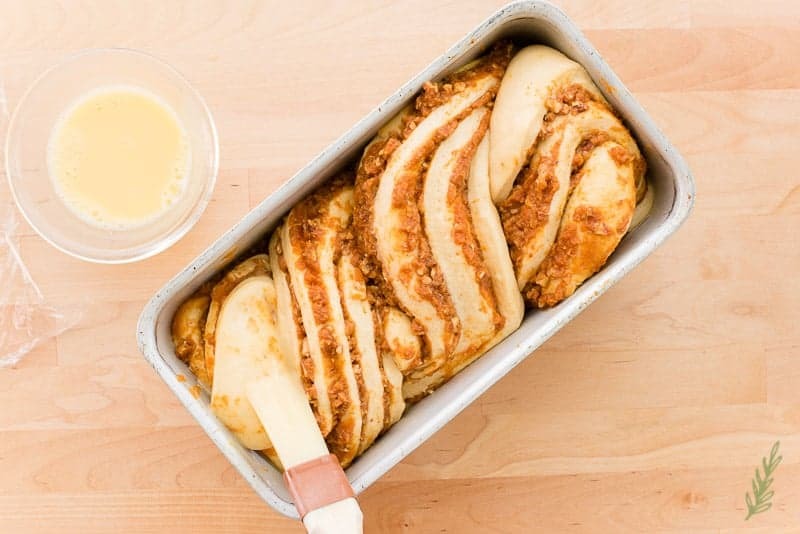 While the dough is rising, whisk together the whole egg and 1 tablespoon of water to make the egg wash.
Brush the surface of the babka with the egg wash, and bake for 1 hour. If you find that the babka is browning too much on one side, rotate the pan. If, after awhile, it's browning too much overall, lightly cover it with a piece of foil. 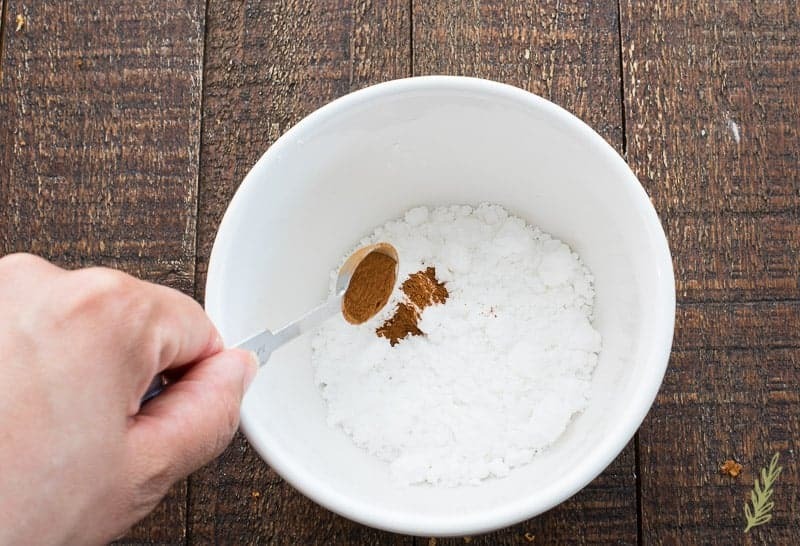 In a small mixing bowl, combine the powdered sugar, ground cinnamon, and salt. Use a small whisk to stir in the maple syrup and milk. The glaze should leave ribbons behind when the whisk is lifted from it. If it's too thick, add a splash of milk until it's the proper consistency. Spoon the Cinnamon-Maple Glaze into a piping bag and set aside for later. If you don't have a piping bag, just leave it in the bowl. When the Pumpkin-Pecan Babka has finished baking, remove it from the oven and allow it to cool, in the pan, for 5 minutes. After 5 minutes, remove it from the pan and transfer it to a cooling rack. Allow it to cool for at least 20 minutes. Snip off the tip of the piping bag and pipe the glaze on to the surface of the babka, or you can also drizzle it from a spoon if you don't have a piping bag. When ready to serve, slice the bread and enjoy! The bread will remain fresh up to 3 days so long as it's sealed in an airtight bag or container. You can glaze the babka even if you plan to freeze the entire loaf, or any part of the loaf. Wrap the slice loaf(ves) in plastic wrap and store in freezer storage bags for up to two months. When ready to serve, thaw the loaves at room temperature and toast. 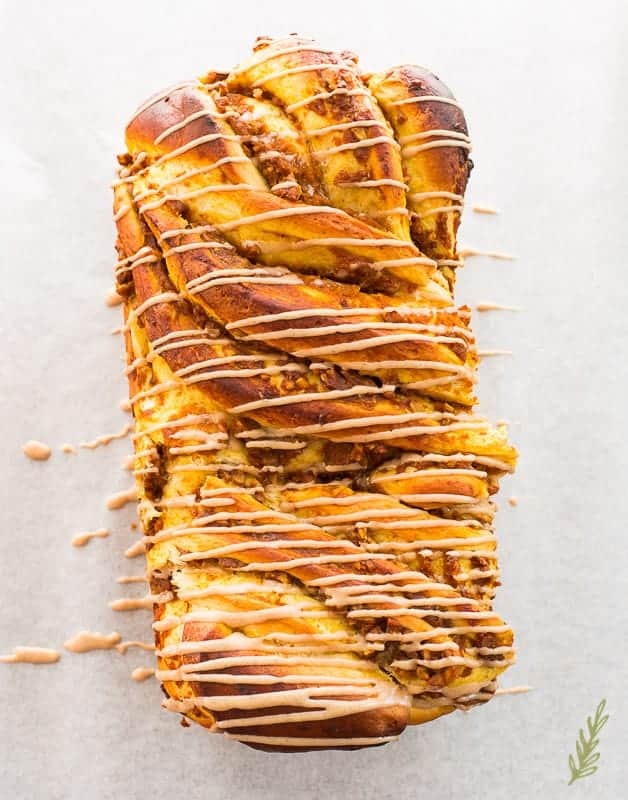 Looking for other recipes like this Pumpkin-Pecan Babka? This is beautiful and your photography is just gorgeous!!! I truly feel like I could conquer this recipe because of your captivating process pictures. That means more than I can express, Jenna! I work really hard to make sure the images are helpful, so I’m happy to hear you think they are. My Mom made something similar to this for us when we were little. She’s a much better baker than I’ll ever be. But I would like to make an attempt at this. Awww, I love the amazing memories we make in the kitchen! You could TOTALLY do it! You just have to try, Mimi! What a delicious fall dish, it looks so yummy! This is honestly one of the prettiest breads I’ve ever seen!! If I was a bread, I’d want to be a lovely one like this too 🙂 Your pictures are very helpful. 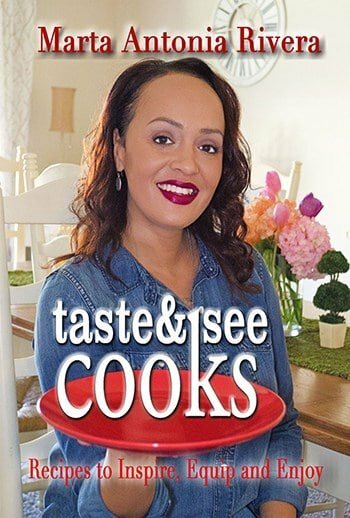 I’m going to see if I can master this recipe by Thanksgiving! Thank you, Maegan! I really do think we all should have bread alter-egos! OH MY GOSH this looks phenomenal. I’m pinning this for Christmas. I love pumpkin in baked goods, and the gorgeous twist is irresistible. Thank you so much, Catherine! And, yes, this is PERFECT for Christmas! I have a huge bag of pecans in my pantry and now they’re going to be converted into a mouthwatering pumpkin-pecan Babka! 🙂 Can’t wait to make this recipe! 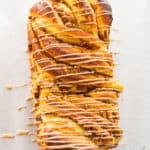 I’ve never tried pumpkin-pecan babka! We’re huge pumpkin fans in my home so I know my family would totally dig this! You’ll definitely love this if you’re a pumpkin fan, Deb! This looks so amazing. Yummy!!! This looks really good. I love the magic of yeast and making my own bread. It IS a wonder, isn’t it, Rachel?